Are my varicose veins a health problem? Are there complications associated with venous disease? If I have symptoms of venous disease, am I at risk of Deep Vein Thrombosis? Is there a cure for venous disease? Are there steps I can take to alleviate the symptoms of venous disease? Should I be treated for my venous disorder? What are the success rates of venous treatment? Are there risks associated with treatment? Are there age restrictions for endovenous treatment? Do vein procedures require a hospital stay? 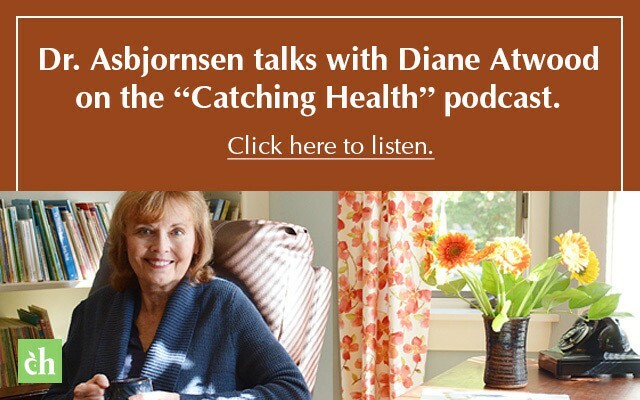 Can I be treated if I am on blood thinners or chronic pain medications? Will my pain/discomfort/swelling/restless leg/varicose veins go away if I am treated? How long is the recovery time for treatment? In addition to endovenous treatment, are there other treatment options? What should I expect from my visit to the Vein Healthcare Center? How do I prepare for my EVLA/Sclerotherapy/Ambulatory Phlebectomy? Where is the Vein Healthcare Center located? Your legs are made up of a network of veins. A healthy vein contains valves which open and close to assist the return of blood to the heart. Venous disease, or vein insufficiency, occurs if these valves become damaged, allowing the backward flow of blood in the legs. This pooling of blood can lead to a feeling of heaviness and fatigue, and cause skin changes such as blue or purple "spider veins" on the skin's surface or a brown woody appearance to your lower legs. If left untreated, it can lead to leg pain, swelling, ulcers, and other health problems. Venous disease symptoms include the presence of varicose or "spider" veins, or pain, swelling or fatigue in the legs. Other symptoms include leg discomfort such as restless leg, cramping, discomfort that worsens throughout the day or while standing, redness or skin changes in the legs, and ulcers. While some physical symptoms can be severe, for some, venous disease may have no physical symptoms. Venous disease is one of the most common conditions affecting our health. According to the American College of Phlebology, 80 million people in the U.S. have some form of venous disorder. It can affect men and women of all ages and activity levels, and while it has a strong genetic component, venous disease can be aggravated by environmental risks, pregnancy, and other factors. Venous disease is common in people who have jobs that require long periods of standing, and the risk of venous disease increases with age. If you have varicose veins in your legs, it is a sign that blood is not being properly returned to the heart. 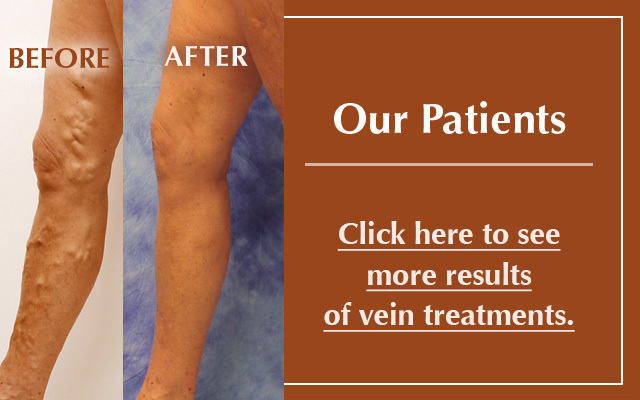 In the past, the presence of varicose veins has been considered strictly a cosmetic issue. Today, we know that varicosity is a symptom of a progressive venous disorder. Untreated, the skin's appearance can worsen, and varicose veins can cause pain and discomfort. Eventually, venous insufficiency can cause serious medical conditions such as phlebitis, cellulitis or ulcers. Even if you have no physical symptoms, the presence of varicose veins can be a source of embarrassment or self-consciousness. Varicose veins can erode self-esteem, lead to the avoidance of social situations where the legs will be exposed, and significantly effect quality of life. Venous disease is a progressive disease, and its symptoms intensify over time. Without treatment, early symptoms of venous disease can lead to lipodermosclerosis, a disease of the skin and connective tissue; an increased chance of superficial venous thrombophlebitis, clotting in the superficial veins that causes severe pain and incapacitation; spontaneous bleeding of a exposed or injured vein; and ulceration, wounds on the leg that will not heal. A clot that occurs in a deep vein is referred to as a deep vein thrombosis (DVT). This can be a serious, life-threatening condition that requires immediate medical care. If the clot breaks free it can travel in your body to your lungs where it is called a Pulmonary Embolism. Sitting in a confined space or traveling for long periods can increase the risk of DVT, but many other factors contribute to its risk, including inherited disorders, certain medications or vein injuries. Steps you can take to prevent DVT include wearing compression stockings during long plane rides or periods of being stationary, and moving regularly during long periods or sitting. Talk with your doctor or contact the Vein Healthcare Center for additional prevention techniques and lifestyle changes that will help reduce your risk of DVT. While symptoms of venous disease can increase the chances of experiencing superficial venous thrombophlebitis or clotting in the superficial veins, there is no indication that those who experience venous disease will have a deep vein thrombosis, nor is DVT a symptom of the progression of venous disease. However, irritation of the vein wall, which occurs in superficial venous thrombophlebitis, can be a risk factor for DVT. While venous disease is treatable, it is an incurable, chronic, and progressive disease. Any symptom of venous disease should be considered an early stage symptom of a serious medical disorder, which, left untreated, can lead to worsening symptoms and complications to overall health and well-being. Yes. Venous disease symptoms respond to lessening the blood flow in the legs and feet to prevent pooling, and supporting the flow of blood back to the heart. There are several steps you can take to alleviate symptoms, including elevating the legs above the heart, wearing loose-fitting clothing, avoiding high-heels, taking frequent breaks if you are sitting for long periods of time, and taking regular walks. Also, wearing compression stockings during pregnancy, on plane rides, or during periods of exertion, help support the return of blood to the heart. Today, the ease, painlessness and exceptionally high success rate of venous therapy has made it possible for most people to enjoy the benefits of treatment while eliminating the risks of progression. Breakthroughs in minimally-invasive treatment of vein disorders mean patients experience less treatment time and less pain, and it has opened the door for many to eliminate discomfort that they may have otherwise chosen to endure. For those experiencing severe or chronic pain or advanced vascular ulcers, treatment can be life-altering. And, for those struggling with the appearance of varicose veins, it can lead to more confidence and improved quality of life. Endovenous laser ablation (EVLA), also called endovenous laser therapy (EVLT™) or radio frequency ablation (RFA), is a minimally invasive treatment used to treat large varicose veins in the legs. It causes the troublesome vein to close and eventually disappear, allowing blood to be diverted to the many other healthy veins in the leg. Other options for treatment include ambulatory phlebectomy, used to remove smaller, superficial veins, and sclerotherapy, performed either with ultrasound-guidance, or with a light-assist, which seals the vein wall of small varicose veins allowing them to fade away. Historically, insurance carriers have considered venous treatments to be cosmetic and therefore non-reimbursable. Today, many insurance carriers understand the medical necessity of venous treatment. All patient experiencing symptoms of venous disease fit the criteria of medical necessity, which includes lifestyle disruption, pain, and complications if the disease is allowed to progress. Prior authorization is required, which can be obtained by your primary care physician or by a Vein Healthcare Center staff member on your behalf. Today's treatments have an excellent initial and long-term success rates when performed by an experienced phlebologist. Ablation procedures, which replaced traditional vein "stripping", were FDA-approved in 1999 using radio frequency, and they are currently performed with either radio frequency (RF) or laser. Both laser and RF have success rates of between 97% and 98% after five years. All medical procedures carry risk. However, endovenous therapy is considered an extremely low risk procedure. Complications are atypical but can include infection and sepsis. There are currently no reported mortalities as a result of endovenous procedures, and infections occur in less than 1% of patients. Other serious risks include a clot in the deep vein system as a result of injury during treatment. Clots pose a serious danger because they can lead to pulmonary embolism or stroke. Again, this is considered a theoretical complication, and no mortalities have ever resulted from endovenous therapy. Treatment can be performed on patients in their teens or in their nineties. Most people who possess motility are eligible for treatment. A thorough health history and physical exam should always be performed before any treatment. 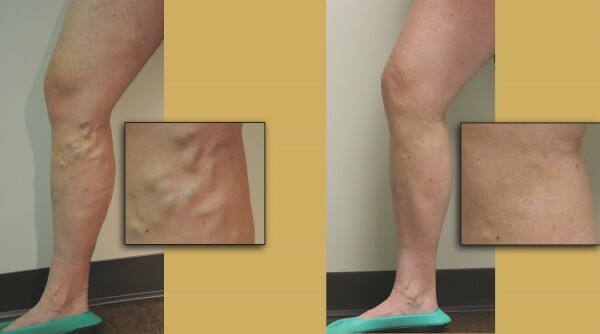 Nearly all of the procedures used today to treat superficial venous insufficiency are performed in an outpatient setting requiring minimal, if any, downtime and very few post-op restrictions. They are performed in the physician's office and do not require a hospital visit or an overnight hospital stay. Yes. If you take these types of medications, treating your veins is not only possible, but it can be advantageous. Always tell your physician about any medications you are taking. Most patients will enjoy immediate relief of their symptoms. Bulges, blue veins, and spider veins will disappear, and symptoms such as heaviness, fatigue, aching, throbbing, itching, swelling and restlessness often resolve immediately following treatment. It is important to note that the maximum benefit of treatment is seen over time, and in some cases, veins take several months to completely disappear. In most cases, those who undergo endovenous treatment can return to their regular daily activities immediately. Most procedures require avoiding strenuous activity initially, but allow engaging in any regular activity after several days. For the first five days following treatment, it is recommended that you avoid exertion, hot tubs and heavy lifting. While endovenous treatments are all minimally invasive, there are non-invasive treatments available that include the use of compression stockings, alternative treatments such as herbal medications, and implementing lifestyle changes and prevention techniques. At the Vein Healthcare Center, we will customize a treatment plan just for you and review all of your options. Check with your insurance provider to confirm whether a not a referral from your primary care physician is required. You are also welcome to schedule an appointment without involving your primary physician. An initial visit the Vein Healthcare Center will usually take between 45 minutes and 1 hour. It will include a consultation with Dr. Asbjornsen, and an ultrasound mapping procedure as part of achieving a comprehensive understanding of how your vein health affects your overall health. 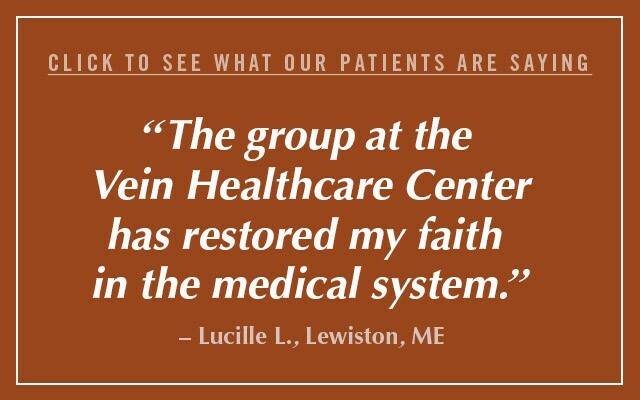 All initial visits are intended to provide a comfortable environment where you have an opportunity to learn about your condition and the opportunities available that will allow you to live a more confident, pain-free life. The Patient Information section provides patient forms to help you prepare for your visit to the Vein Healthcare Center and gives you easy access to guidelines following your treatment. 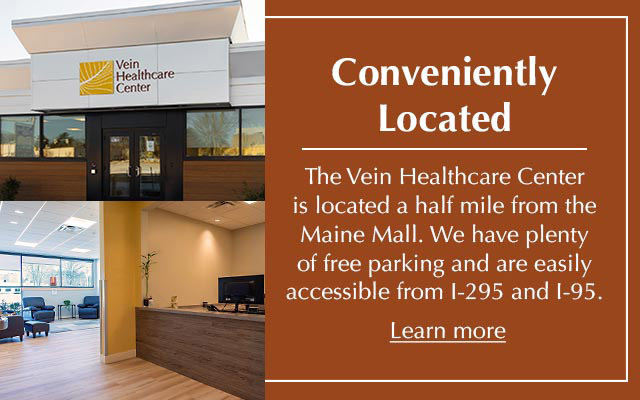 The Vein Healthcare Center is located at 100 Foden Road, Suite 307, Building West, South Portland, Maine. Get directions and view a map of our location. Call the Vein Healthcare Center at 207-221-7799 to ask a question or to schedule an appointment at our South Portland office. Get relief now. 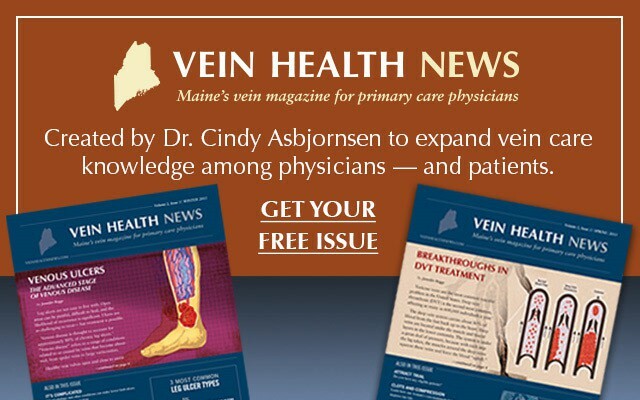 Read "10 Things you can do to ease your venous disease symptoms"
Get practical, easy-to-understand explanations about vein treatment in this ACP-produced video. Click here to watch.